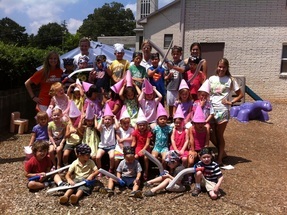 WCUMCP offers 8 weeks of summer camp for ages 2 years to rising Kindergarten. Summer camp begins at 9:30 and ends at 1:00. Snack is provided, you send a lunch. Ages 2 1/2 to rising 1st grade **Must be potty trained for this group. ​Check our summer camp registration form for schedule and themes. Our summer camp fills up fast - call ahead to make sure your requested week is available. Weekly themes subject to change. For children not registered in the WCUMC preschool program, the school charges a registration fee of $50 per child to attend summer camp.